A new tool launching today at the Cass Innovate conference at City, University of London, aims to make the process of finding and researching new story ideas more efficient and creative for journalists. INJECT has received financial support from the European Union's Horizon 2020 programme and it also incorporates the prototype version of the project, City University's Google-funded JUICE. 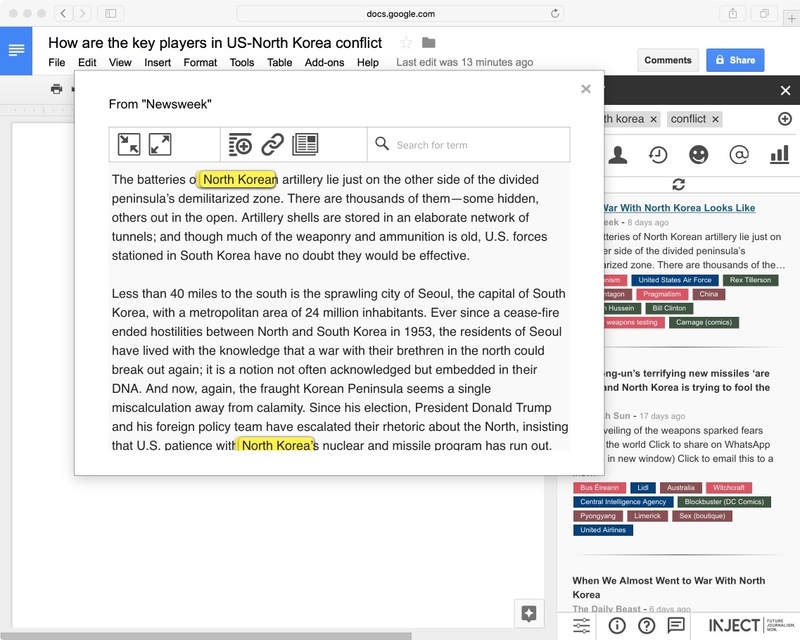 The tool uses natural language processing to enable reporters to be more inspired and productive when coming up with new angles for stories, through a number of research strategies. Two other strategies which are due to be implemented are: ramifications, which are the opposite of causal and looks into the future consequences of, for example, Marine Le Pen's victory in France; and a strategy focused on data visualisation, searching for stories that contain data, such as pie charts, graphs or maps. INJECT will ultimately become a subscription-based service, where journalists and organisations can pay different fees according to which version of the tool they want to use, and this model is likely to be implemented after the summer. 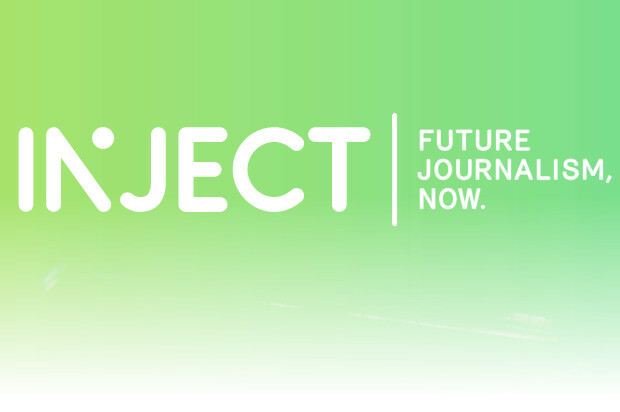 In the meantime, journalists are able to register their interest for the tool and if selected, they can test INJECT for free and provide feedback to the project team. The tool can be incorporated into journalists' existing workflows in two ways, explained Neil Maiden, professor of digital creativity at Cass Business School. The first one is as a standalone online platform, which reporters can use to do their research and write their story before publishing it. The second method is using the plug-in version of the tool and connecting it to WordPress, if that is the CMS used by their news organisation. "We tried to understand how journalists work," Maiden told Journalism.co.uk. "There's often a saying of 'yet another tool' – you don't need yet another tool and another window open on your desktop, so we tried to remove that." The tool can be tailored to search only through one news outlet's archive, or more widely, across a collection of titles. It also incorporates card-based system Explaain, so reporters can build a stack of reusable cards with key information about their story. The cards can be embedded in the published piece, but they can also be saved and referenced later on. "It's not something you're copying and pasting from somewhere else, so you have the right to use it because you've written it." When talking to journalists in the early stages of the project, many expressed a need for a feature that allowed them to also search across languages, Maiden added, so INJECT has automated translation and so far supports French, Dutch and Norwegian. 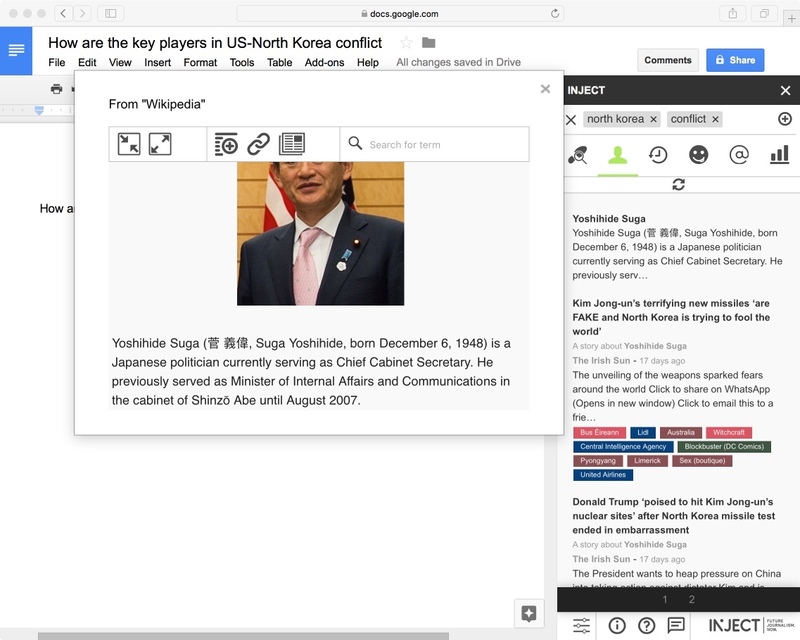 If a journalist searches for a keyword in English, the tool can translate it into one of the other three languages available, showing results from outlets in those countries. "There is a desire to hone in on your own news sources and archives, but also to look at different data sources, so you could plug the tool into the UK's National Statistics Database, for example. "INJECT was originally conceived to search news stories but it can also search other sources of information." George Brock, professor of journalism at City, University of London, said the tool is trying to solve two issues at once: one is allowing journalists to find and include references "with a high degree of confidence and accuracy for both the reporter and the reader". The other is to make the research experience easier for journalists. "One of the things that strikes me as quite odd in a lot of serious, quality journalism is the lack of references in other dimensions," he told Journalism.co.uk. "When you're reading something online, at any point you can go through and drill down, to amplify your understanding or verify something, but so far, we have developed quite limited ways of making those extra dimensions and extra uses easy for the reader and the reporter to understand." Brock said these limited approaches are the reason why stories do not include as many links, references and footnotes as they should, which has an effect on whether or not readers choose to trust an article and its source. "If people are constantly asking themselves 'how do I know whether this is true? ', the simplest and most obvious answer is 'you should be able to put your cursor over a term and check what its background and basis is. "I'm not suggesting it will solve every problem, but I think it will help."